Whether a company operates global facilities or just imports/exports goods to the United States, personnel and advisors must understand regulatory requirements. Most companies that ship or receive goods internationally have developed MCS that address regulatory requirements; however, these typically are labor intensive, independent of other company systems, adequately address only their primary location, and are not updated in a timely manner. Supply chain logistics is complicated, and this book details how to avoid security holds on shipments and gives sound advice on how to cope if another "9/11" occurs. The book provides easy to understand guidance to shipping/receiving personnel, safety inspectors, transportation and logistics managers on the movement of hazardous cargo from one location to another ensuring compliance to the maze of regulatory requirements. JOHN PHYPER is Executive Vice President at Atrion International, Inc. He has coauthored several books on management systems and environmental legislation. PHILIPPE DUCAS is a Senior Manager of Product Stewardship Solutions and Customer Care with Atrion International, Inc. 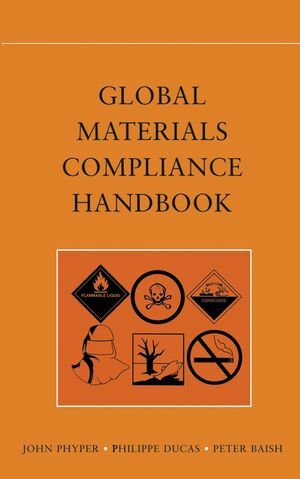 He has extensive experience with global materials compliance requirements. PETER BAISH is a former senior executive with U.S. Customs with extensive experience in field operations, enforcement, and anti-terrorism. 2. Chemical Registration, Notification and Listing. 3. Material Safety jData Sheets. PART II: MATERIAL COMPLIANCE SYSTEMS. 8. Impact of Terrorism on the Supply Chain. Appendix 3: Material Management Internet Web Sites. Appendix 4: Import/Export Web Sites. Appendix 5: Occupational Exposures Limits Legislation.